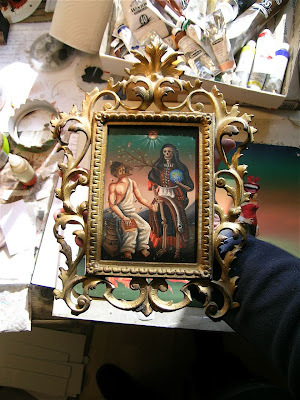 I've just finished a new little version of 'The Teacher' (you can see a bigger version of it in yesterday's post), made to fit a decorative frame I found at a swapmeet recently. As I used to do in New Zealand, I'd trawl junk shops and opshops for old period frames to mount my paintings in. Often, I'd have to work on a specific sized surface that I'd have to cut especially for the frame rebate. It was a hassle if I didn't pull-off the painting as then I'd have to have another go at repainting the idea, trying to get it right for the frame. I recently also found an old photographic frame for an 8x10 Ambrotype or tintype, so I've painted a retablo of an old view camera to mount in it. I'll post that as soon as I've photographed the work in the frame.